UK Tour with Facade Ensemble! Watch the Trailer for ELEGY! An adaptation of the Schoenberg Piano Concerto, Op. 42 for a chamber group of 14 players, using Schoenberg’s own distinctive instrumentation of the Kammersymphonie Op. 9, has been commissioned by Pina Napolitano (www.pina.com) from Hugh Collins Rice (Oriel College, Oxford University), a British composer and scholar who dedicated his Master’s thesis to the piece, and who is a great proponent of the work. The chamber ensemble is logistically and financially easier to assemble and tour than the full orchestra, and likewise easier to promote to festivals. It also has the benefit of being more flexible in terms of rhythmic subtlety and musical dialogue with the piano, allowing for a more nuanced study and performance of the work. The project aims to promote the concerto to achieve the core-repertoire status it deserves. Pina Napolitano is very committed to modern and contemporary repertoire, and to Schoenberg and the music of the Second Viennese School in particular. This project builds on the success of her debut disc of the complete piano works by Arnold Schoenberg (published by Odradek Records in 2012). The disc met with very positive critical response in international specialized press (see below), and was followed by a series of concerts across Europe, where she regularly performed the entire program from memory. A documentary video of the project and video trailer will be produced by Odradek Records. 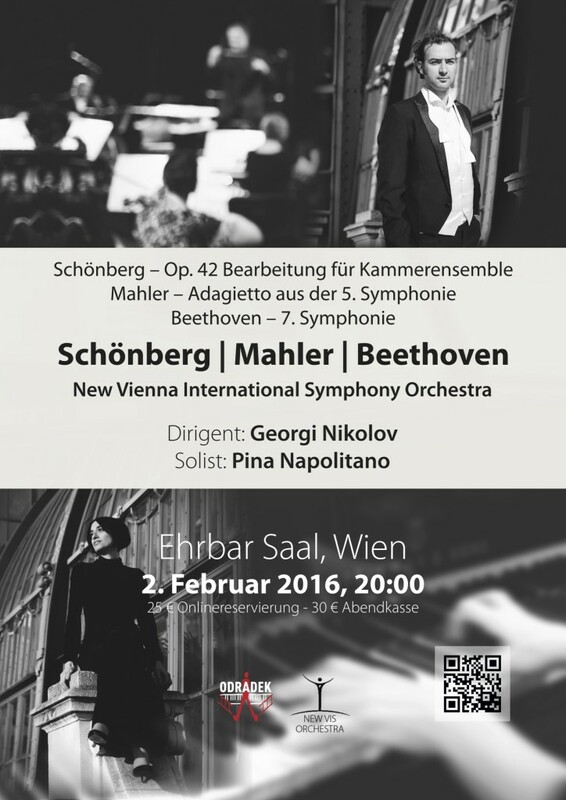 The first public performance will take place at the Ehrbaarsaal, Vienna on February 2, 2016, directed by Georgi Nikolov. It will be programmed alongside the Adagietto from Mahler’s Fifth Symphony and Beethoven Symphony No. 7. The New Vienna International Symphony Orchestra is composed of a group of young musicians based in Vienna, formed by graduates chosen among the city’s three primary conservatories. Georgi Nikolov, from Bulgaria, is a young, talented conductor, cellist, and tenor, currently living in Vienna. He studied conducting under Maximilian Cenčić. His experience at the podium includes works of Bach, Haydn, Mozart, Beethoven, Schubert, Strauss, Tchaikovsky, Brahms, Wagner, Bizet, Puccini, Rachmaninov, Bruckner, and Mahler, as well as modern works of Schoenberg and Shostakovich, and contemporary Bulgarian works by Vladigerov, Pipkov, and Hadjiev. In 2015 he set up his own youth orchestra, and has performed frequently with them. Georgi Nikolov has been also a guest conductor for the Vienna Traditional Orchestra, the Pressbaum Orchestra, and currently music director and principal conductor of the New Vienna International Symphony Orchestra. He has toured as cellist and as conductor across the Far East and Europe, including four tours in China directing the Vienna Festival Orchestra. Future projects include tournée in Japan and in China, and he is programmed in festivals in Germany, Luxembourg and Switzerland. The reduction commissioned by Pina Napolitano uses the ensemble of Schoenberg’s Chamber Symphony Op. 9 (with the exception of contra-bassoon). This enables performance with Schoenberg’s Chamber Symphony Op. 9. Alternative possible pairings include Schoenberg Op. 29 Suite, whose ensemble is contained within it, and the addition of a harp allows it to be programmed with the Webern Symphony. It could also easily be programmed with Mahler song arrangements. Masterclass – Liège – Musique en Mouvement asbl.